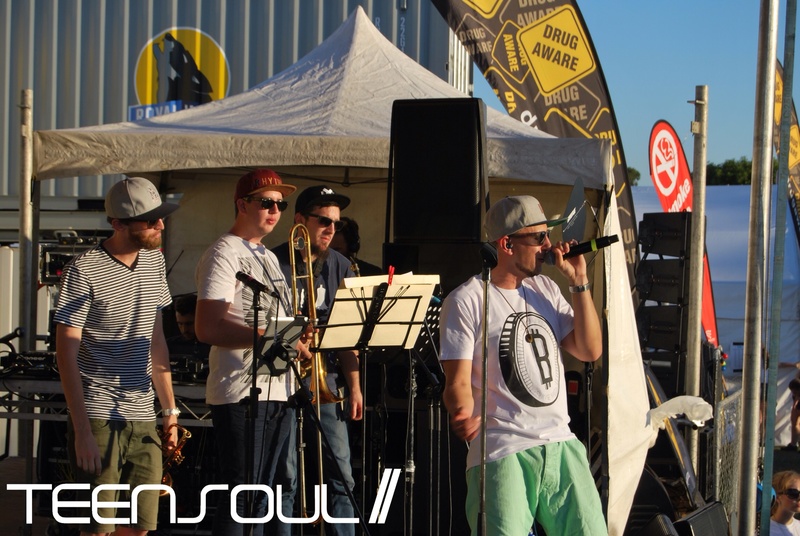 Teensoul had the chance for post set catch-ups with Perth emcee, Coin Banks at HyperFest, as he educated us on the urban graffiti scene and decadent soul food that describes his sound. When did you realise music was something you wanted to do with your life? Coin Banks: I started freestyling when I was doing graffiti and I never thought ‘Oh I want to do music’ and just did it for fun with a group and really loved it. It was never something I wanted to do but just something I had fun doing and then when I left the group I decided I would pursue it. Brendan (Coin Banks Saxaphone Player): Initially for me it was purely ideological, I was always brought up on martial arts and then when I was 17 my master basically told me to go out and do something else because I was arrogant and needed a quick shut down so I tried music because I’d done a bit. I tried out for WAAPA and just got turned down flat because I was awful, that hit my pride and I started practicing six hours a day, tried out again, didn’t get in, started practicing eight hours a day and then finally got in and by that time music was something I really loved. How did you come up with the name ‘Coin Banks’? Coin Banks: Really boring story, I used to write Coin as a graffiti name and the first part of my surname is Banks. A lot of ‘80s and ‘90s hip hop, the emcees were graffiti writers as well as break dancers, they did the four elements and although it’s pretty much a dead part of our culture now, back then they did graffiti before they were rappers and then they’d have that name and just use it for their rapping as well. Do you have any pre-set rituals or traditions before a gig? Coin Banks: I do when I can if I’ve got time and the rider. It’s not really a ritual but I usually have peppermint tea with honey, a eucalyptus lolly and do some stretches. I like to chill out by myself and do that. What food best describes your sound? Coin Banks: What’s something sweet but also spicy? Can I say fried chicken waffles with hot sauce? It’s soul food! What advice would you give to teenagers wanting to produce their own music? Coin Banks: Practice and don’t be shy to show it to people. Until you show it to someone you’re not going to do anything with it. You have to show it to someone and they’ll tell you it’s either crap or great and even if they say it’s crap then that means you should go back and try again.